A decent amount of work goes into making homemade lasagna, but as long as you can handle multi-tasking, it won’t consume your entire day. Start by mixing up your crepe batter. Let it rest while you get going on your filling components. 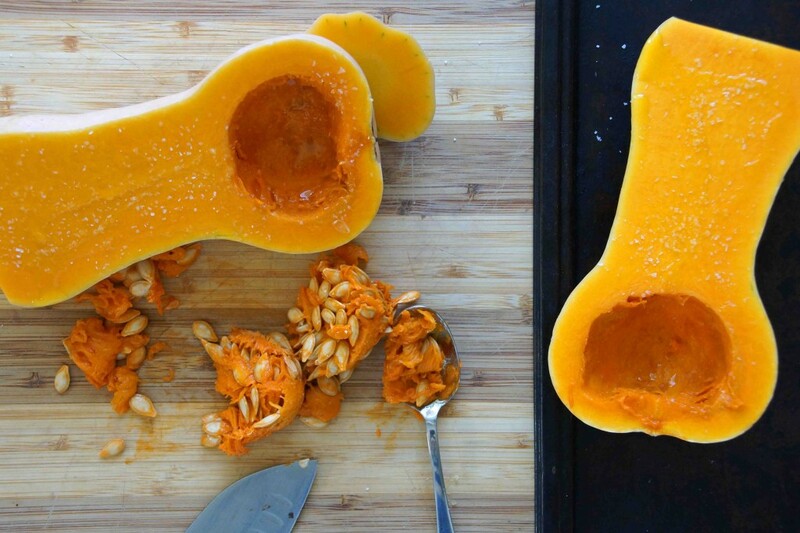 Cut a butternut squash in half and get it into the oven to roast. 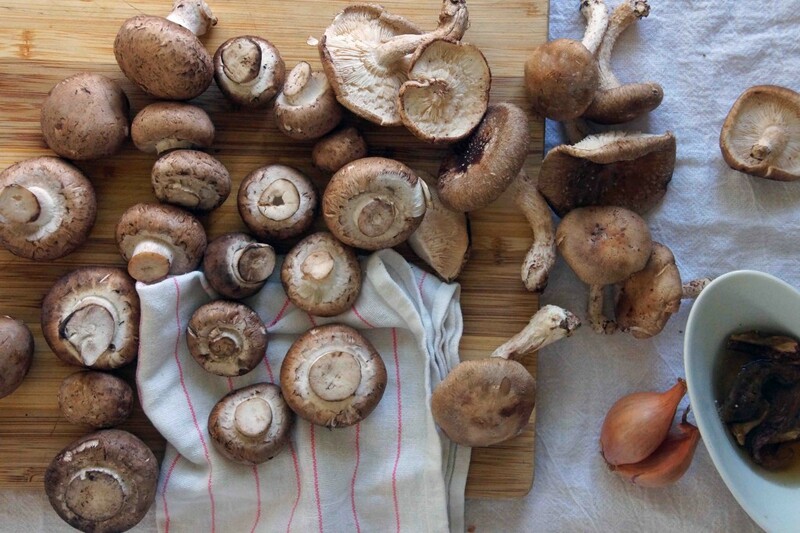 While the squash is roasting, clean a bunch of mushrooms. Matt swears I keep him around solely to clean mushrooms, but I did all of these by myself. Ha! Quarter the mushrooms, pop them in a food processor with a shallot, and pulse until finely chopped. We’re making mushroom duxelles. If you don’t wait tables for a living and aren’t familiar with the term, just know it’s a fancy way of saying super-tasty mushroom spread. Seriously, I could put it on anything and everything. Saute the mushroom and shallot mixture in butter until the liquid from the mushrooms boils off and you are left with a thick and fragrant mushroom paste. Stir in a splash of dry Marsala and try not to eat it all right off the spoon. Next up, béchamel. We’ll use a simple white sauce to bind all the layers and flavors together. Make a roux with butter and flour then whisk in hot milk until it’s thick and creamy. We’re getting there. Time to make the crepes. 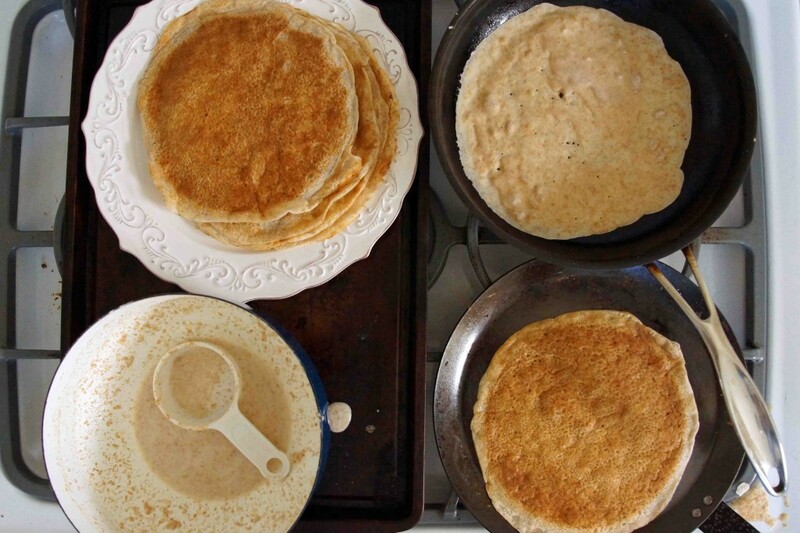 Set up a work station on your stove and start flipping crepes. Don’t worry–the first couple never turn out. I lost one to each pan and I still had plenty for the lasagna. Check the squash. Tender? Good. Scoop out the flesh, puree, and season. 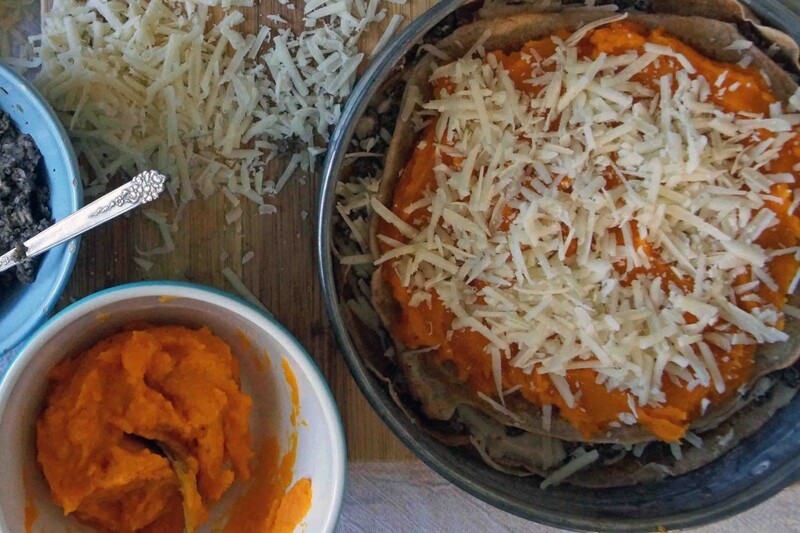 Grate some cheese and you’re ready to put it all together. Butter a springform pan and get all your separate components together. Start building your lasagna. 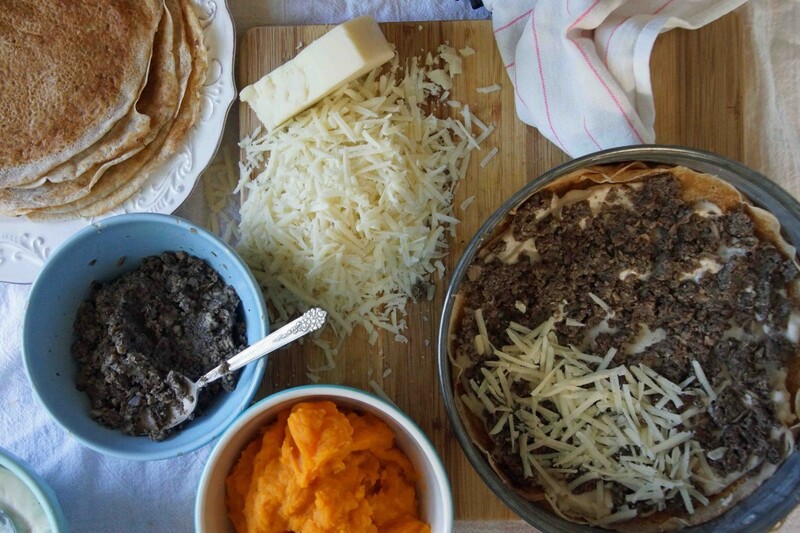 Line the bottom of the pan with crepes, then layer on béchamel, mushroom duxelles, and cheese. 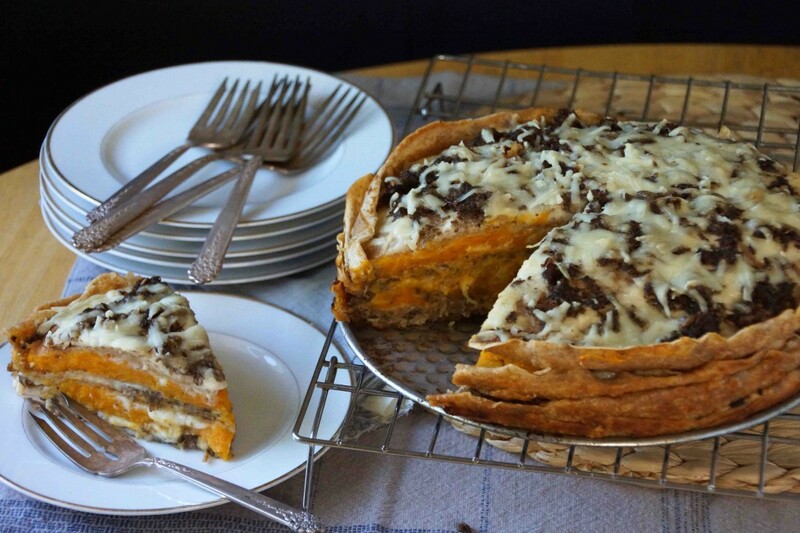 Cover with another crepe layer and spread with squash puree, sprinkle with cheese. Repeat until you’ve used up all your ingredients. Phew…the hard part is over. Put that lasagna in the oven and take it easy while it bakes. 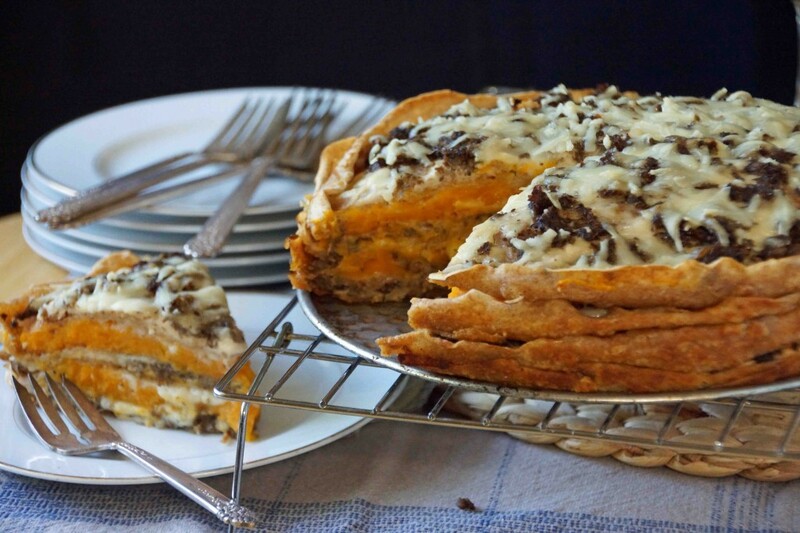 Pour yourself a glass of wine and write about this crepe lasagna in your food journal. You’re going to want to remember it. A fair amount of work goes into making homemade lasagna, but you could easily make all of the components a day ahead and assemble and bake the lasagna the day you plan to serve it. Make the crepe batter. 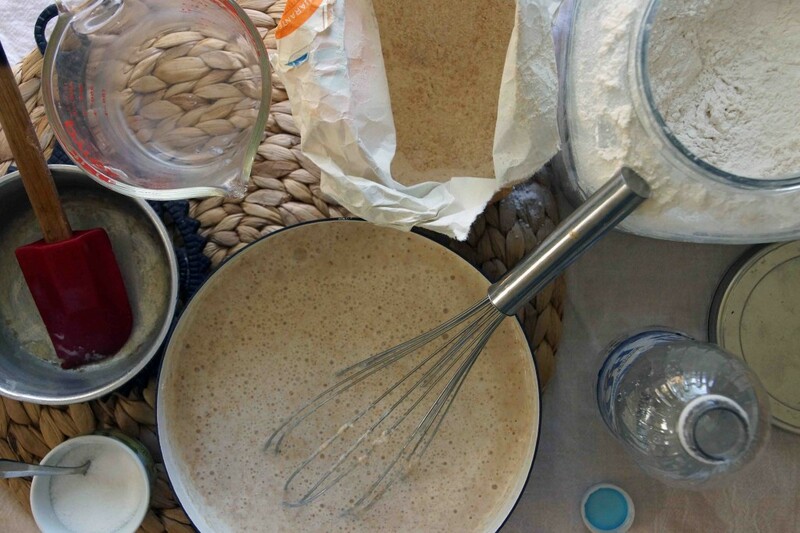 Mix together the crepe ingredients until smooth. Allow to rest for at least 30 minutes. Meanwhile, rub the flesh of the squash with a little olive oil and sprinkle with salt. Roast until tender about 45 minutes. 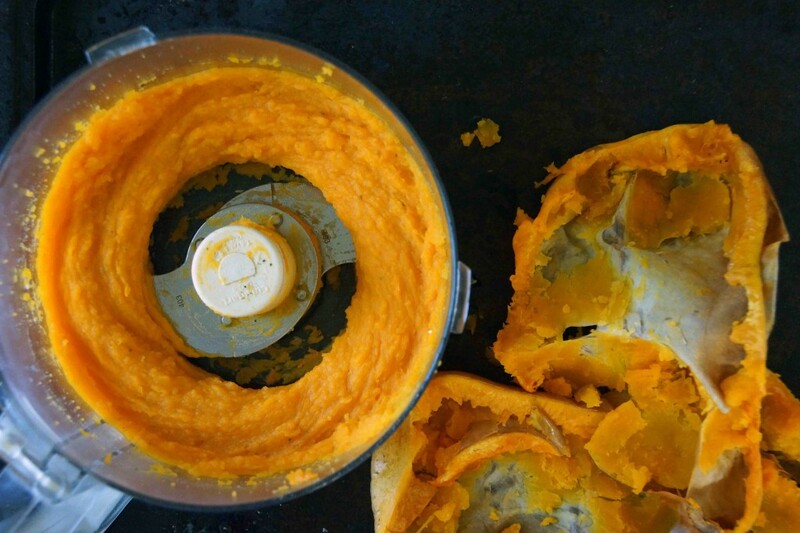 Allow to cool enough to handle, scoop out the flesh, and, using a food processor, puree until smooth. Season with salt and pepper. 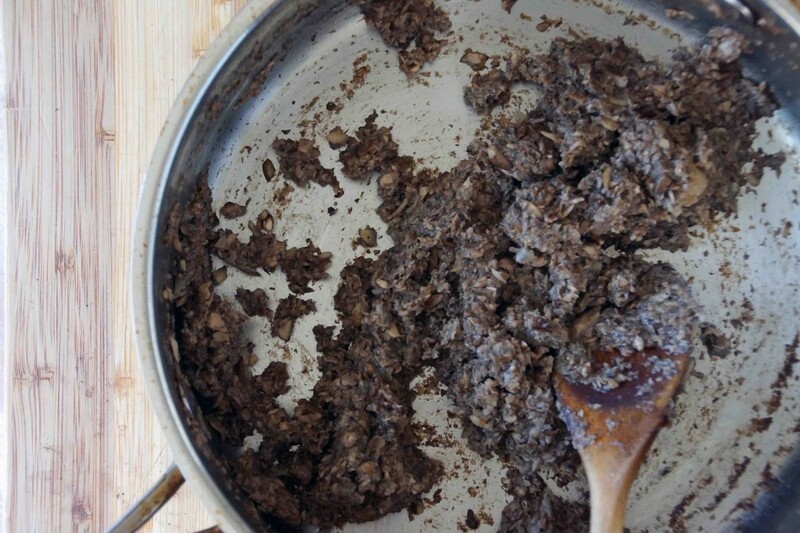 While the squash is roasting, make the mushroom duxelles. 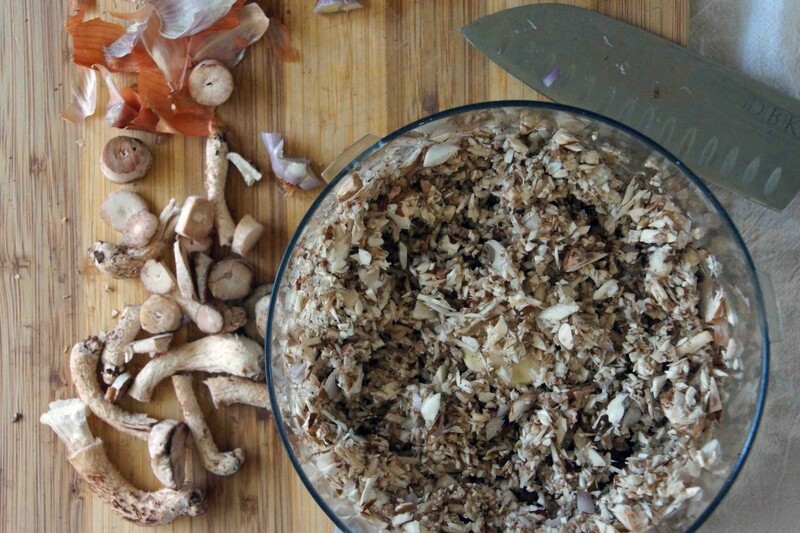 Place the quartered fresh mushrooms, the porcini, and the shallot in a food processor and pulse until the mushrooms are finely minced. Heat 2 Tbsp. butter in a wide sauté pan. Add the mushroom mixture and sauté until the pan is quite dry, 10-15 minutes. Season with salt, add the Marsala, and continue to sauté until the pan is dry again, another 10 minutes or so. Taste. Season with black pepper and additional salt, as needed. While the mushrooms are cooking, make the béchamel. See, it's all about multi-tasking! 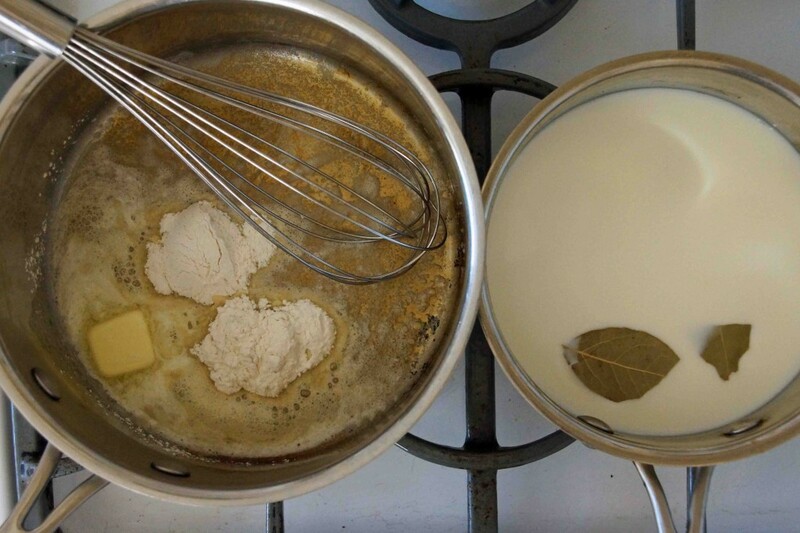 Heat the milk and bay leaf in a small saucepan to almost a boil. In a medium saucepan, make a roux with the butter and flour. Melt the butter over medium-high heat and whisk in the flour. Cook, stirring often, until the mixture turns a light golden and it loses its raw flour taste. Slowly pour the hot milk into the pan, whisking constantly. Continue to whisk until the sauce thickens, about 10 minutes. Season with salt, pepper, and a few gratings of nutmeg. Transfer to a small bowl and cover the top with plastic until you're ready to use it so the sauce won't develop a film on top. Next, make the crepes. Heat a crepe pan (or any non-stick frying pan) over medium-high heat. Using a paper towel, apply a thin layer of vegetable oil to the pan. Pour about ⅓ c. of the batter into the pan and quickly swirl it around until it coats the bottom of the pan. If your batter seems too thick to accomplish this, thin it out with more milk. Cook until the crepe releases from the bottom of the pan, about 1 minute. Flip and cook on the other side for 30 seconds or until golden. Transfer to a plate and repeat until you are out of batter. Time to assemble the lasagna! Butter a spring-form pan. Create a base with a crepe. My crepes were not quite large enough to make a full layer, so I pieced each layer together with 1 full crepe and pieces of another. It didn't make any difference in how the end product looked or tasted. Spread the crepe with about 1/3 of the béchamel sauce followed by 1/3 of the mushrooms. Sprinkle with a little cheese, then top with another layer of crepes. Spread the crepe with about 1/2 of the squash puree, sprinkle with cheese, and top with another crepe. Repeat. 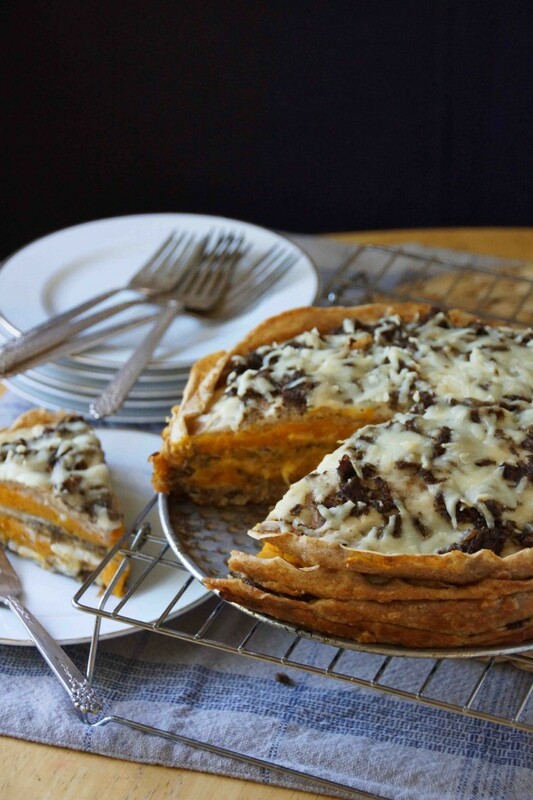 End with a béchamel and mushroom layer topped with plenty of cheese. 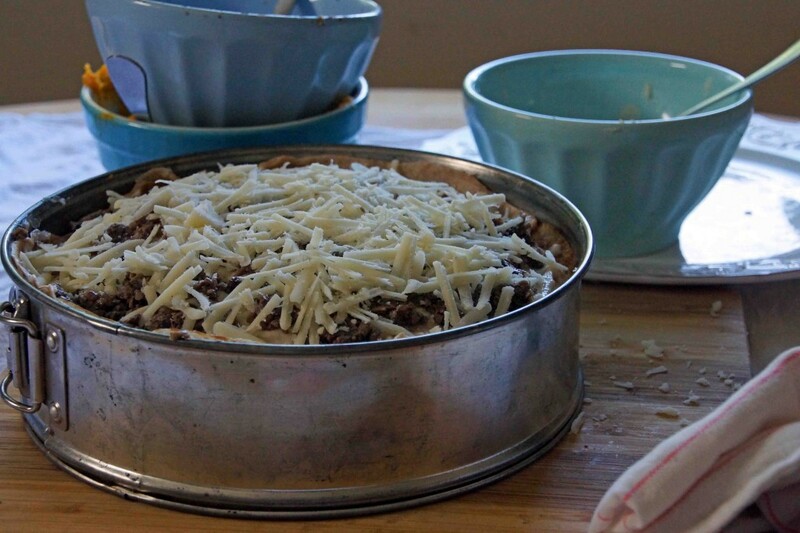 Cover the lasagna loosely with foil with a few holes in the top to let the steam escape. Make sure the foil does not touch the cheese or it will pull it all off when you remove it. Place the spring-form pan on a baking sheet and bake at 375° for 30 minutes. Remove the foil and bake for another 15-20 minutes until the cheese is melted and the edges start to crisp. Allow to cool for 15 minutes (it will be much easier to cut) before serving. My oh my, what a delicious looking lasagna and vegetarian to boot. This post is golden! 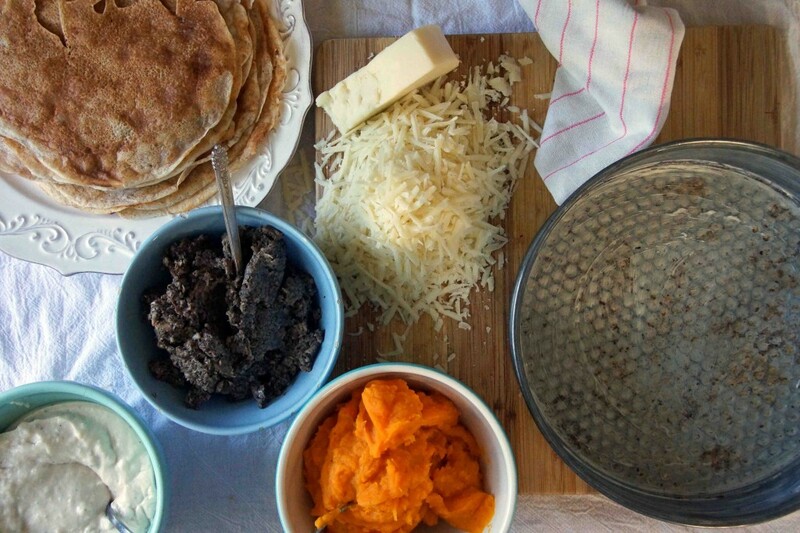 Especially the duxelles part…I’ve never heard of it before but I’m sure going to try it with some crusty bread now! 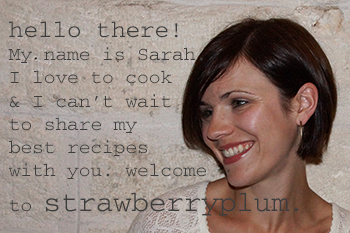 Another good food and recipe from you. Thanks. I am adding this to my fav and list to make. Thanks. When did you say you’re having us over for dinner and do I get to pick what you make? I vote for this! Dad won’t even miss the meat! I wish your Nonna and Zia could try some of your cooking – they’d be so proud! Whenever you want! As I was making this, I was thinking about how I could “Dad-ify” it. Maybe Bolognese instead of the squash? And I wish I’d had more opportunities to learn from zia and nonna…I’m sure they could school me.